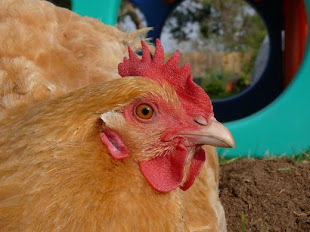 Chicken Blog: Braver Than Ever Before! Yesterday, while I was circling my regular traffic route around my domestic perils, some interesting things happened. The first things was, Flartus, my Flartopian Fairy Godmother, bestowed merciful wisdom on my thick head. I know many of you, and my mom, have tried to do the same, and I listen, and I try to mature, wise-up, get smart, make a plan, delegate, crack a whip... but I always seem to try to find my way out of trouble by the same old roads, and no surprise: getting out of the same traffic by taking the same route rarely does any good. It is a constant battle and I do have some particularly difficult circumstances, but Flartus kind of cleared a path for me to see an alternate way. I have been overwhelmed by those particularly difficult circumstances, and during my pity party, things have gotten out of control. So, what I was struggling with was, where to begin?! This is how I put it in my sidebar: "how can I get the upper hand on a home that is pretty much a disorganized and chaotic tornado alley? I think my biggest obstacle (after laziness) is feeling defeated at the start. Seems like no matter how much I accomplish, the setbacks are greater than my actual progress." So. I began to think backwards, or inside out. I tried to take a whole new approach. And thus began the second thing: instead of washing dishes, and starting laundry, I told William to keep doing loads, and then I reminded him throughout the day, but I did not worry or stress about that. Instead of cleaning their bathroom, or tidying the living room, I went to the single most neglected room of all: my office. My office, and the master bedroom always come in last place. I run out of time. I run out of pep. I close the door, and my eyes, and those two rooms suffer. Not this time, I decided. The third occurrence to shake things up, and get me out of my traffic pattern, was the sudden and unexpected arrival of Sir Robin of Cramalot. Just when I decided: hey, why not start with Me? Why not begin where I normally stop? What if I made my space tidy, organized, decontaminated, and happy? Maybe the best route is backwards... And then Sir Robin, tripping over debris, came forward and gave me this look of utter dismay. He was appalled, yet kindly sympathetic, because he knows what it is to face our fears and weaknesses, and it really made me open my eyes. His expression confirmed that my space was too sorely neglected to come in last any more. Oh, Sir Robin! Arriving here, to my office, this may be your single greatest act of bravery yet. (And I should add it was brave of my mom and dad to sit in here, too: sorry, guys!) Brave, brave Sir Robin, thank you for helping me see that things have gotten out of hand, and that I must not surrender. I cannot run away! 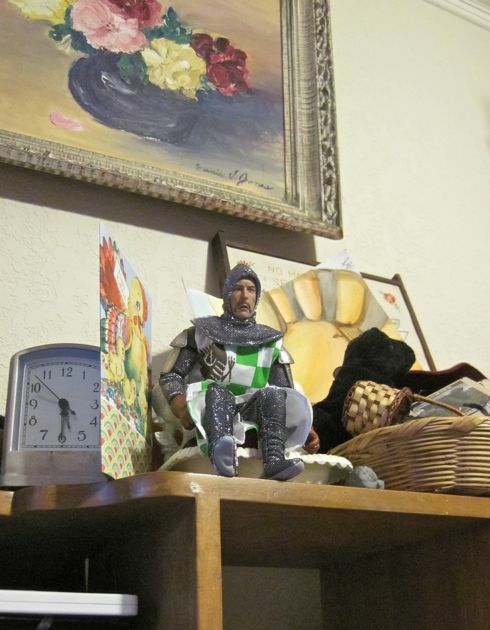 Sir Robin found himself a perch overlooking my desk, and while I was under the desk digging through the layers, I felt his knightly eyes on me, and knew he was disgusted pleased to see me taking this brave new route. My office is much improved. The children foraged for dinner, I found enough reserve energy to attend to other matters, and I still have sufficient confidence to carry on today, in my backwards is the new forward approach. I'm sort of stalling, sitting here blogging. Time to carry on with my quest. 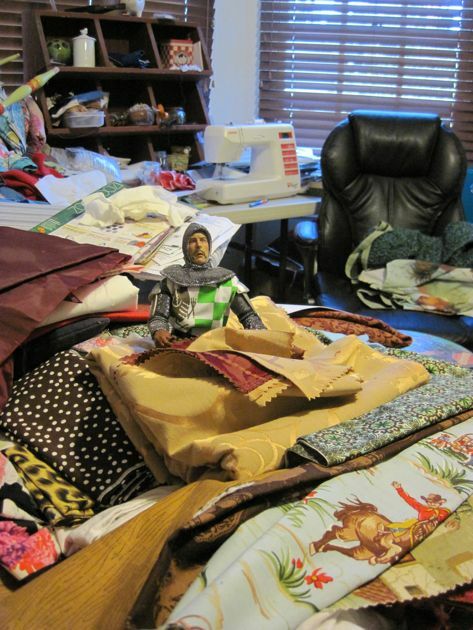 lol, Sir Robin looks like he's perched on a throne... of the ceramic variety. Aw, thanks for the blog love. I'm so glad you took my comments in a positive way, and happy that you're feeling re-inspired. Maybe, if you can keep your own personal space clean, you will feel calmer about the rest. "Hey, MY room is clean; I don't see the problem." Well, onward and outward, or some such. I really love your Sir Robin mascot, I have to tell you. His expression is priceless. It seems to fit any occasion.